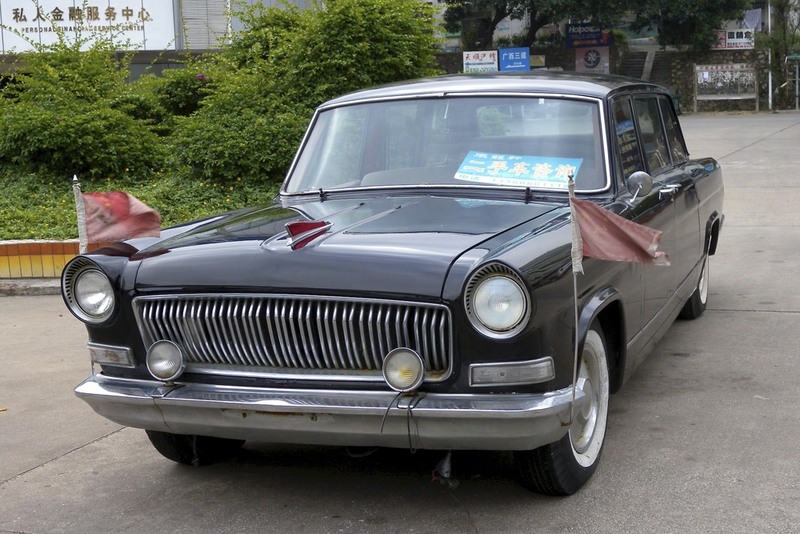 You see them as museum exhibits, but rarely there is a first generation Hongqi, 红旗 (Red Flag) in the streets in China. It has been a Chinese icon and a proud symbol of the People's Republic of China. The first generation 红旗 (Red Flag) has been introduced by First Automotive Works (FAW) in 1958 on the basis of a 1955 Crysler. The car was mainly used by Chinese Government Officials. It became famous beyond China by the coverage of President Nixon's visit in 1972, when Chaiman Mao was riding in the convertible. It was powered by a 147 kW V8 engine, and in 1965 a streched three seat row derivate was launched. The car stayed in production until 1981 without major changes. The second generation Hongqi was a licensed re-badged Audi 100. It was streched and supplemented by a smaller 1.8 l Hongqi Mingshi. Production of the second generation ended in 2006 and the third generation, on the basis of a Toyota Crown Majesta, stayed successless as it did not attract private customers. The forth generation Hongqi, called HQE, was used by Premier Hu Jingtao during the parades of the 60th anniversary of the People's Republic of China in 2009. This car was already shown as a concept in 2005 on the Shanghai Motor Show. FAW announced a fith generation Hongqui for 2012, which will be based on the C6 version of the Audi A6.